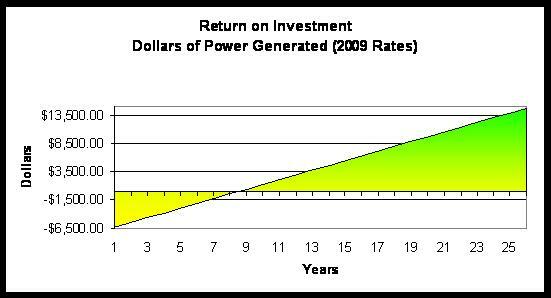 Return on Investment (ROI) is one thing that you want to achieve as much as possible and as quick as possible. With a solar electric system, as long as it is working, you are guaranteed to make back your money–its just a matter of when. As long as the sun shines, you can make money by selling back the energy to a utility using net-metering or use the energy yourself as to offset your electric bill. The upfront costs of solar electric systems and long payback periods have limited the entry point to only long term investors, but as the panel prices go down–more and more people are willing to enter into the market. As solar module efficiencies rise and energy prices go up, solar electric is bound to pay off. When you look at all the embodied energy it takes to make a solar panel, you are a looking at a 3-5 year payback. That is just to replace or offset all the energy it took to make/manufacture the panel itself. This is kind of a hypothetical worry, if you are worried about climate change and zeroing out your carbon footprint…now lets talk about the money! A typical kilowatt (approximately 100 square feet of panel) will cost $6,500 to $8,000 installed. The average Dec 2009 cost of solar module panels electricity price per killowatt hour is 35.27 cents for residential purposes (http://www.solarbuzz.com/solarprices.htm), that is what that electricity cost you to make, versus the power plant charging 10 cents. The physical site’s solar access. Some years are cloudier and dirtier than others. What price the utility buys back electricity, sometimes it is a locked under-market rate based on a contract, usually due to the remittance of a rebate that the utility provided for the installation of the power generation system. Remember that a rebate program is suppose to offset the costs of building a new coal-fired power plant. Putting an active renewable power generation system on a poorly insulated or leaky house will take longer to save money. Conducting an energy audit for about $200-400 and carrying out some Energy Efficient Measures (EEMs) will help make money, and not just offset energy loss in a leaky house. You can actually make money and offset your energy use with an energy efficient house. Find your average Insolation per day, this can be found at the NREL Insolation Charts. In the United States, in the Midwest where I am, average flat plate collector at latitude can be 4 to 5 kWh/m2 per day. Cost/Price off kWh from your provider, usually this is about 10 cents or .1069 cents per kWh. This can fluctuate, in Hawaii it is about 45cents per kWh. Cost of System installed after tax incentive or rebate. Look up your solar rebate for your state and federal tax incentives. Any energy you produce after this is really your return on your investment. Here is another great article about an array that costs $265K, and the 13.8% ROI, the savings from an electric bill will go into the investor’s 401k. Good, thx, just what I had been trying to find, bookmarked.